Lavish and intensely enchanting, the De Medici Collier vessel-sink, strikingly catches one's eye, as though it were a rare diamond necklace in a black tie affair. This oval vessel-sink, enticing and desirable, refined like silver and purified like gold. This luxury vessel-sink has a powerful presence all on its own. Posh with simplicity, the Collier is designed for any contemporary or transitional style. Made out of luxurious crystal based material enhanced with its true color. De Medici Collier is available in designer inspired color: Black. 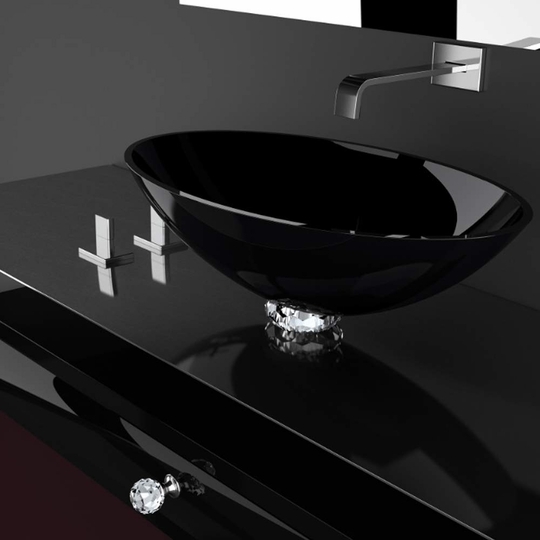 This luxury vessel-sink represents the fashion of a city synonymous with sophistication to your bath or powder room. Countertop installation ensures this sink will stand out in your bathroom as a striking focal point. Cristallo De Medici is one of the most exquisite and cutting-edge crystal design materials made of pure crystal with a 24%l lead content. These products are mouth-blown & beveled in by hand. Cristallo De Medici is unique making it suitable for most luxury design applications.